ObjectivesThe aim of this study was to develop a clinical risk model that is predictive of in-hospital mortality in elderly patients hospitalized with acute heart failure (AHF).Methods2486 patients who were 60 years and older from intensive care units of Cardiology Department in the hospital were analyzed. Independent risk factors for in-hospital mortality were obtained by binary logistic regression and then used to establish the risk prediction score system (RPSS). The area under the curve (AUC) of receiver operator characteristic and C-statistic test were adopted to assess the performance of RPSS and to compare with previous get with the guidelines–heart failure (GWTG-HF).ResultsBy binary logistic regression analysis, heart rate (OR: 1.043, 95% CI: 1.030–1.057, P < 0.001), left ventricular ejection fraction (OR: 0.918, 95% CI: 0.833–0.966, P < 0.001), pH value (OR: 0.001, 95% CI: 0.000–0.002, P < 0.001), renal dysfunction (OR: 0.120, 95% CI: 0.066–0.220, P < 0.001) and NT-pro BNP (OR: 3.463, 95% CI: 1.870–6.413, P < 0.001) were independent risk factors of in-hospital mortality for elderly AHF patients. Additionally, RPSS, which was composed of all the above-mentioned parameters, provided a better risk prediction than GWTG-THF (AUC: 0.873 vs. 0.818, P = 0.016).ConclusionsOur risk prediction model, RPSS, provided a good prediction for in-hospital mortality in elderly patients with AHF. To develop and validate a new Simplified Acute Physiology Score, the SAPS II, from a large sample of surgical and medical patients, and to provide a method to convert the score to a probability of hospital mortality. The SAPS II and the probability of hospital mortality were developed and validated using data from consecutive admissions to 137 adult medical and/or surgical intensive care units in 12 countries. The 13,152 patients were randomly divided into developmental (65%) and validation (35%) samples. Patients younger than 18 years, burn patients, coronary care patients, and cardiac surgery patients were excluded. Vital status at hospital discharge. The SAPS II includes only 17 variables: 12 physiology variables, age, type of admission (scheduled surgical, unscheduled surgical, or medical), and three underlying disease variables (acquired immunodeficiency syndrome, metastatic cancer, and hematologic malignancy). Goodness-of-fit tests indicated that the model performed well in the developmental sample and validated well in an independent sample of patients (P = .883 and P = .104 in the developmental and validation samples, respectively). The area under the receiver operating characteristic curve was 0.88 in the developmental sample and 0.86 in the validation sample. The SAPS II, based on a large international sample of patients, provides an estimate of the risk of death without having to specify a primary diagnosis. This is a starting point for future evaluation of the efficiency of intensive care units. 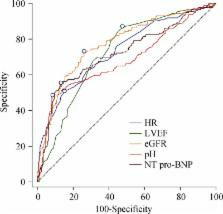 To construct a scoring system for the prediction of early mortality in cardiac surgical patients in Europe on the basis of objective risk factors. The EuroSCORE database was divided into developmental and validation subsets. In the former, risk factors deemed to be objective, credible, obtainable and difficult to falsify were weighted on the basis of regression analysis. An additive score of predicted mortality was constructed. Its calibration and discrimination characteristics were assessed in the validation dataset. Thresholds were defined to distinguish low, moderate and high risk groups. The developmental dataset had 13,302 patients, calibration by Hosmer Lemeshow Chi square was (8) = 8.26 (P 200 micromol/l (2), active endocarditis (3) and critical preoperative state (3). Cardiac factors were unstable angina on intravenous nitrates (2), reduced left ventricular ejection fraction (30-50%: 1, 60 mmHg (2). Operation-related factors were emergency (2), other than isolated coronary surgery (2), thoracic aorta surgery (3) and surgery for postinfarct septal rupture (4). The scoring system was then applied to three risk groups. The low risk group (EuroSCORE 1-2) had 4529 patients with 36 deaths (0.8%), 95% confidence limits for observed mortality (0.56-1.10) and for expected mortality (1.27-1.29). The medium risk group (EuroSCORE 3-5) had 5977 patients with 182 deaths (3%), observed mortality (2.62-3.51), predicted (2.90-2.94). The high risk group (EuroSCORE 6 plus) had 4293 patients with 480 deaths (11.2%) observed mortality (10.25-12.16), predicted (10.93-11.54). Overall, there were 698 deaths in 14,799 patients (4.7%), observed mortality (4.37-5.06), predicted (4.72-4.95). EuroSCORE is a simple, objective and up-to-date system for assessing heart surgery, soundly based on one of the largest, most complete and accurate databases in European cardiac surgical history. We recommend its widespread use. Correspondence to: Kun–Lun HE, MD & Ya–Ping TIAN, MD, Core Laboratory of Translational Medicine, Chinese PLA General Hospital, Fuxing Road, Beijing 100853, China. E-mails: hekl301@ 123456hotmail.com (He KL) & tianyp@ 123456301hospital.com.cn (TIAN YP). This is an open-access article distributed under the terms of the Creative Commons Attribution-NonCommercial-ShareAlike 3.0 Unported License, which allows readers to alter, transform, or build upon the article and then distribute the resulting work under the same or similar license to this one. The work must be attributed back to the original author and commercial use is not permitted without specific permission. Impact of the β1-adrenoceptor Arg389Gly polymorphism on heart-rate responses to bisoprolol and carvedilol in heart-failure patients. Diastolic and systolic asynchrony in patients with diastolic heart failure: a common but ignored condition.